George “G” Masao Yamazawa, Jr. performed a powerful spoken word piece at the National Youth Summit on Japanese American Incarceration in World War II. Photo by Tracy Kumono. Hamano Shachu of Urasenke Tea Society presented two ryu-rei style tea ceremonies, which date to the early Meiji era and have since then been enjoyed all over the world. Photo by Nobuyuki Okada. 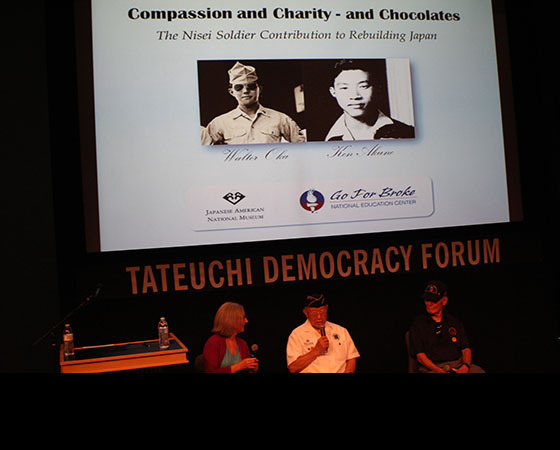 Military Intelligence Service (MIS) veterans discussed the duties of the Nisei soldiers and how their acts of kindness and charity toward the Japanese people helped to heal the country and turn it into a strong ally for the United States. Photo by Richard Murakami. 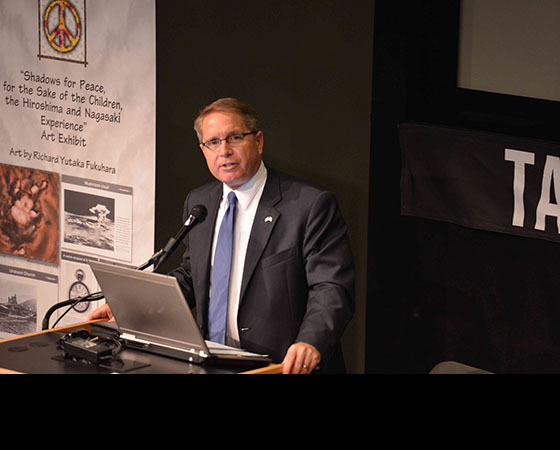 Doug Erber, President of the Japan America Society of Southern California, served as emcee for an event commemorating the 70th anniversary of the dropping of atomic bombs on Hiroshima and Nagasaki. Photo by Tsuneo Takasugi. Leading taiko and flute practitioners Kenny Endo and Kaoru Watanabe combined Japanese theater, folk traditions, jazz, and other improvisational genres to wow a crowd with their fusion of the ancient and modern. Photo by Richard Murakami. The Latin American Cinemateca of Los Angeles, a cultural organization dedicated to supporting and cultivating Latin American cinema, held its 7th annual Latino Student Film Festival in the Tateuchi Democracy Forum, celebrating the work from students in the Los Angeles area. 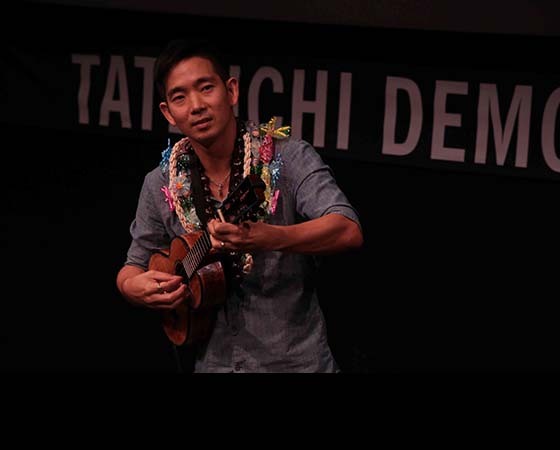 Jake Shimabukuro performs live for a sold-out crowd following a screening of Jake Shimabukuro: Life on Four Strings. Photo by Gary Ono. 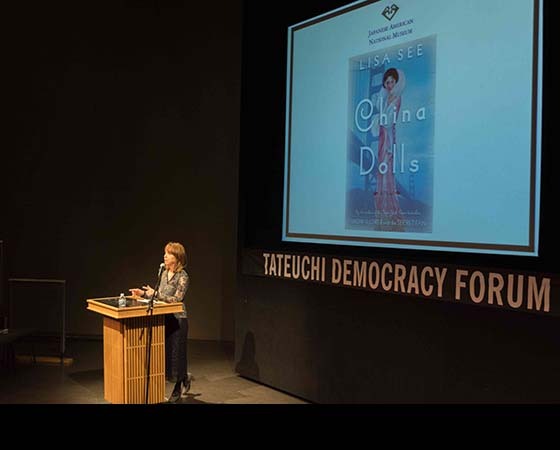 Bestselling author Lisa See discussed her latest book, China Dolls, and her family’s personal connection to the Japanese American incarceration experience. Photo by Ben Furuta. 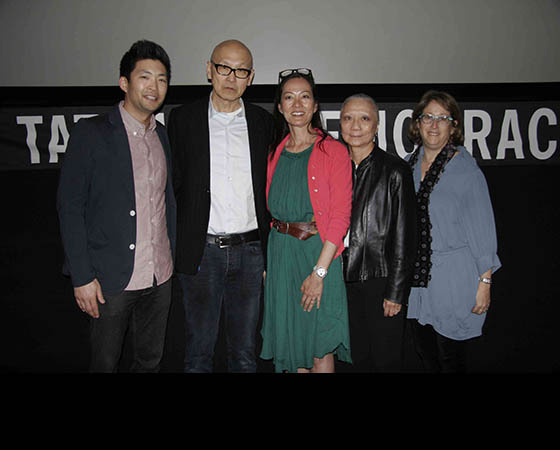 Cast and crew members from The Joy Luck Club, including director Wayne Wang (second from left) were on hand for a post-screening discussion about the film, which kicked off a new screening series, Big Trouble in Little Tokyo. Photo by Tsuneo Takesugi. The Atsuhiko & Ina Goodwin Tateuchi Foundation, located in Seattle, Washington, is one of the Japanese American National Museum’s cherished supporters. JANM’s Tateuchi Democracy Forum is a versatile 198-seat space that provides comfortable stadium-style seating in a state-of-the-art technical setting with excellent acoustics. Originally opened in 2005, the Forum was named for the Tateuchi Foundation in 2009 in appreciation of a $2 million gift. Beyond presentations officially under the Tateuchi Public Program Series banner, the Tateuchi Democracy Forum is used for a wide variety of events, both public and private. 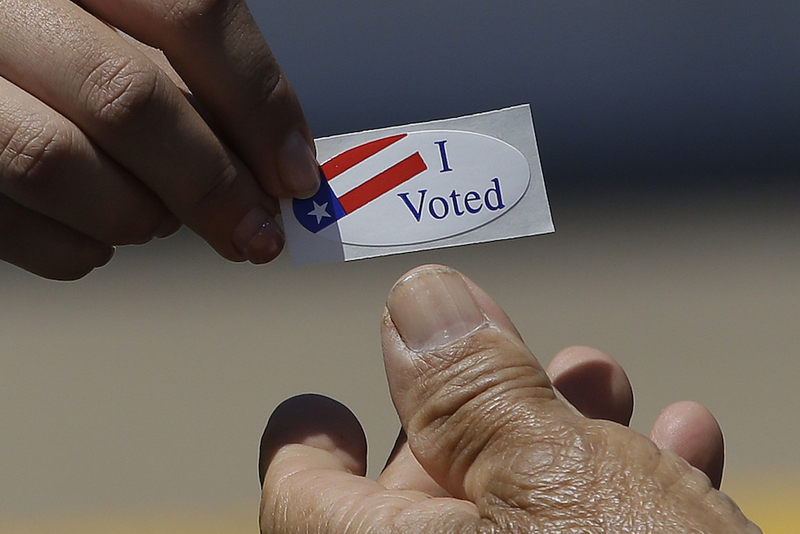 The Tateuchi Democracy Forum also plays a key role in JANM’s K–12 School Visits Program. Documentary screenings, taiko drumming demonstrations, and discussions about liberty and equality in a democratic society happen in the Forum several times each month. Through the first half of 2014, almost 8,000 students had their visit to JANM enhanced through activity in the Tateuchi Democracy Forum. Programs are free for JANM members and free with general admission for non-members, unless otherwise noted. Please check each event listing for pricing and RSVP information. To see a complete listing of the museum’s programs, visit janm.org/events. How much can we learn about people different from ourselves from interactions in their restaurants, bakeries, and markets? Are we changed by the experiences we have when dining out? Does Los Angeles have its own distinctive food culture, and if so how is it changing? This program will explore how diverse cultures in Los Angeles have shaped its food and informed the city’s culinary landscape. Panelists will discuss connections between the things and places we eat and the way we interact with the diverse peoples who help shape our city. 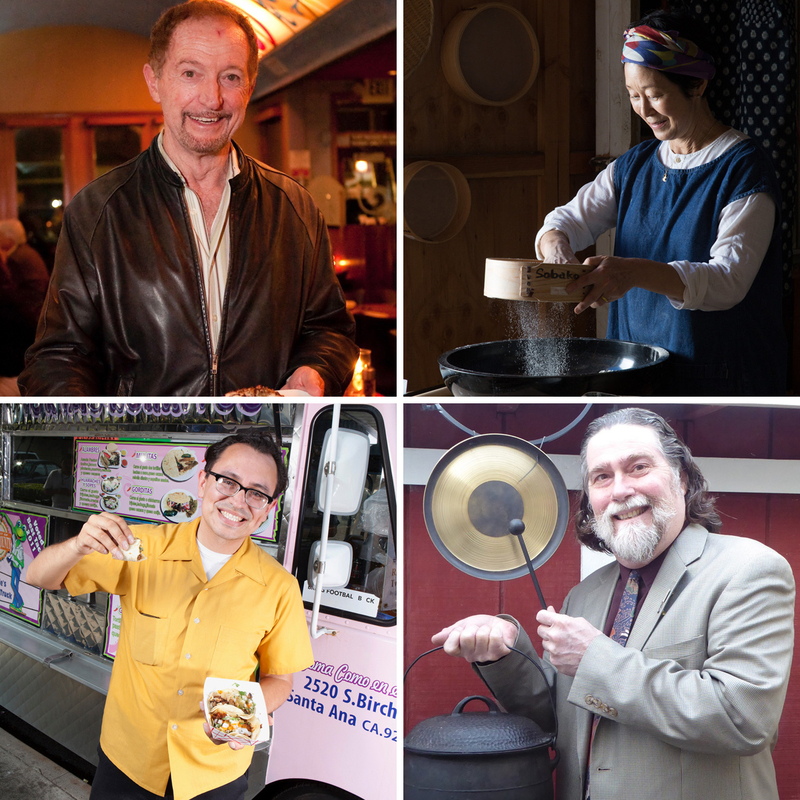 Panelists include Gustavo Arellano, features writer for the Los Angeles Times and author of Taco USA: How Mexican Food Conquered America; cookbook author and cooking instructor Sonoko Sakai; and Guy Gabriele, a restauranteur in the LA area since the 1970s. Richard Foss from the Culinary Historians of Southern California will moderate this lively discussion. In partnership with the Department of Cultural Affairs, City of Los Angeles. 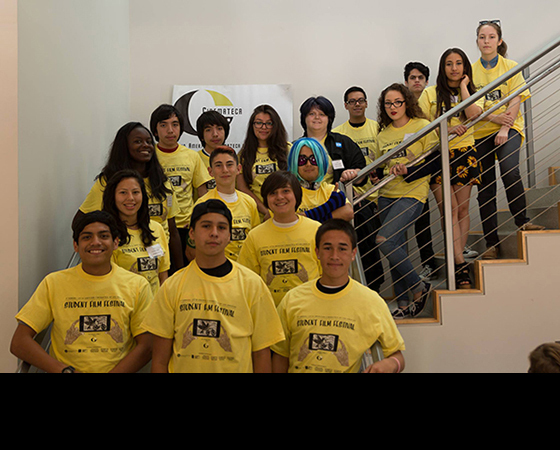 In May, JANM was proud to host the 2016 edition of the Smithsonian’s National Youth Summit, which was webcast live to students across the country and around the world. A panel discussion explored the history and legacy of the US government’s incarceration of Japanese Americans during World War II and considered how fear and prejudice can upset the delicate balance between the rights of citizens and the power of the state. Moderated by David Ono, co-anchor for ABC7 Eyewitness News and producer of the acclaimed documentary Legacy of Heart Mountain, the panel featured a dynamic range of knowledgeable speakers, including Karen Korematsu, Founder and Executive Director of the Fred T. Korematsu Institute; educator and camp survivor William “Bill” Shishima; Lorraine Bannai, Director of the Fred T. Korematsu Center for Law and Equality at Seattle University School of Law; Hussam Ayloush, Executive Director of the Los Angeles office of the Council on American Islamic Relations; and activist and Culver City High School student Mariko Fujimoto Rooks. Educator and spoken word artist George “G” Masao Yamazawa, Jr. and rapper and UC Santa Barbara student “Kamikaze” Kane Tenorio also contributed their talents and perspectives to the event. The webcast is now available online. In April, JANM screened The Empty Chair, a documentary centered on Alaska native John Tanaka. In 1942, Tanaka was going to be the valedictorian of his high school graduating class, but was scheduled to be incarcerated by the US government before the ceremony could take place. In response, the Juneau school board voted to hold a special early graduation ceremony for him. When the official ceremony was held for the class of ’42, they placed an empty chair on the platform to acknowledge Tanaka’s absence. Tanaka went on to volunteer for service in the all-Japanese American 442nd Regimental Combat Team while his family remained in an American concentration camp. Following the screening, director Greg Chaney participated in a panel discussion along with Mary T. Abo and Alice Hikido, two sisters who also grew up in Juneau and were interviewed for the film, and David Albright, whose grandfather, Walter Fukuyama, is also featured in the film. All JANM members were invited to a private screening of Under the Blood Red Sun. Based on the acclaimed book by Graham Salisbury, the film is a coming-of-age story set against the backdrop of the Japanese attack on Pearl Harbor during World War II. Based on actual events, the film is a testament to friendship, courage, and survival. A panel discussion with director Tim Savage and actors Chris Tashima and Kalama Epstein followed the screening. In the early Meiji era, Kyoto Prefecture held the first tea exposition in Japan. The governor of Kyoto asked the 11th Urasenke Grand Tea Master, Gengensai, to create a new tea ceremony style, so that foreign guests could experience the most sophisticated Japanese culture comfortably. The ryu-rei style of tea ceremony was born, in which the host and guests are seated in chairs instead of the traditional tatami mat; this ceremony could be conducted almost anywhere, even outdoors. It was a great success and since then, this type of tea ceremony has been enjoyed all over the world. 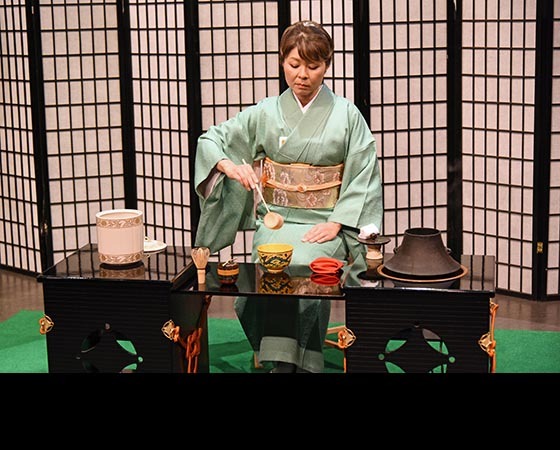 At JANM, Hamano Shachu of Urasenke Tea Society presented two ryu-rei style tea ceremonies using a misono-dana table. During more than ten trips to Japan over a period of five years, author and photographer (and former Los Angeles County District Attorney) Gil Garcetti captured the stunning images reproduced in this limited edition, hardbound portfolio. The photographs are accompanied by illuminating essays, in both English and Japanese, from such noted authors as Pico Iyer, Kendall Brown, Hitoshi Abe, and Atsuko Tanaka. Garcetti discussed his book, and signed copies for those in attendance. This panel discussion, timed to commemorate the end of World War II and the beginning of the Allied occupation of Japan, explored the role of the mostly-Nisei branch of the Military Intelligence Service (MIS) in the rebuilding of Japan after the war. MIS veterans discussed the duties of the Nisei soldiers and how their acts of kindness and charity toward the Japanese people helped to heal the country and turn it into a strong ally for the United States. After the bombing of Pearl Harbor in 1941, thousands of American citizens of Japanese ancestry who were in Japan at the time were barred from returning to the United States until after the war ended. Through ten interviews that encompass a range of experiences and attitudes, this documentary film takes an inside look at the experiences of the stranded American citizens. The screening was followed by a discussion with mother-and-son filmmakers Mary McDonald and Thomas Mazawa, whose own relatives’ stories inspired the film, and Henry Yasuda, a longtime JANM volunteer and American-born citizen who was attending school in Japan when World War II broke out. JANM screened this award-winning film that tells the story of Roy Matsumoto, a Nisei who became a World War II hero when he fought against the Japanese as part of Merrill’s Marauders, an American guerrilla unit. He also did work in military intelligence, which was kept secret for 50 years. Matsumoto had one brother who also fought for the Americans and three who fought for the Japanese, while his parents and sisters decided to relocate to their ancestral home of Hiroshima. The family’s heartrending story, told by Roy’s daughter Karen, encapsulates the complex issues faced by Japanese Americans during this time. The screening was followed by a discussion with Karen Matsumoto and filmmakers Lucy Ostrander and Don Sellers. In commemoration of the 70th anniversary of the dropping of atomic bombs on the Japanese cities of Hiroshima and Nagasaki, this forum, presented by JANM and the Orange Coast Optimist Club, addressed the devastating and ongoing effects of nuclear weapons on the people of Japan and the world. Speakers discussed the legacy of the nuclear age and video interviews with hibakusha (atomic bomb survivors) were presented. Doug Erber, President of the Japan America Society of Southern California, served as emcee. Artists Paul Frank, Simone Legno, and Brandi Milne, whose work is featured in the contemporary art portion of Hello! Exploring the Supercute World of Hello Kitty, participated in a panel discussion about their work and how Hello Kitty served as inspiration. Actor/writer/comedian Eliot Schwartz acted as moderator; the artists signed exhibition catalogs following the discussion. JANM kicked off a new film screening series, Big Trouble in Little Tokyo, with The Joy Luck Club, followed by a panel discussion with the film’s director, Wayne Wang; actress Rosalind Chao; film editor Maysie Hoy; and casting director Heidi Levitt. The film series is presented in partnership with Angry Asian Man, First Pond Entertainment, and Visual Communications. On a bi-monthly basis, it highlights movies by and about Asian Americans. Bestselling author Lisa See discussed her latest book, China Dolls, a World War II-era drama of friendship and betrayal among three women whose lives cross in the glamorous nightclubs of San Francisco’s Chinatown. The women’s fortunes take a turn after the Japanese bombing of Pearl Harbor, and the book includes detailed accounts of the WWII imprisonment of Japanese Americans. 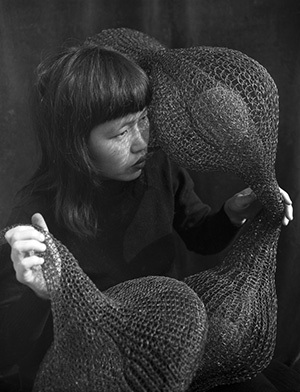 See spoke of her family’s personal connections to the Japanese American incarceration experience and her grandfather’s early efforts to exhibit art by Asian Americans. In conjunction with Angry Asian Man, First Pond Entertainment, and Visual Communications, JANM kicked off the holidays with a screening of Jake Shimabukuro: Life on Four Strings. The film is an inspiring portrait of an inventive musician whose virtuoso ukulele skills have transformed all previous notions of the instrument’s potential. The film was followed by a discussion between Shimabukuro and the film’s director, Tadashi Nakamura, and then a live performance. To Be Takei, a documentary exploring the life of actor and activist George Takei, was screened as a prelude to Okaeri: A Nikkei LGBTQ Gathering, a day of educational and storytelling workshops for the LGBTQ members of the Nikkei community and their friends, family, and allies. The film offers an unprecedented glimpse into the daily like of George and his husband/business partner, Brad, and chronicles George’s personal journey from childhood in a Japanese American incarceration camp to his iconic and groundbreaking role as Sulu on Star Trek to his rise as a pop culture icon and respected advocate for civil rights. JANM was especially proud to present the film as George currently sits on its Board of Trustees and is a Chairman Emeritus of the museum. In addition, Brad and George were married at JANM, and George is the 2015 recipient of JANM’s Distinguished Medal of Honor for Lifetime Achievement and Public Service. This beloved film was screened for a full house of fans who expressed their enthusiasm with applause during classic scenes. Following the screening, the audience was treated to a panel discussion with stars Ralph Macchio, Billy Zabka, and Martin Kove; director John Avildsen; and Aly Morita, daughter of the movie’s “Mr. Miyagi,” Pat Morita, who passed away in 2005. Darryl Vidal, who choreographed the martial arts scenes, was also on hand and offered an extended explanation of the iconic crane kick, created specifically by Vidal for The Karate Kid. Scott Akasaki, the Los Angeles Dodgers Director of Team Travel, engaged former team manager and Hall-of-Famer Tommy Lasorda in a discussion about the latter’s role as a baseball ambassador to Japan and other countries. The Japanese tea ceremony (chanoyu or sado) is a highly choreographed ritual of preparing and serving green tea (matcha) with traditional sweets to balance the bitter taste of the tea. These two free demonstrations of the ceremony are a popular annual occurrence. The Latin American Cinemateca of Los Angeles is a non-profit viewer-sponsored film exhibition and cultural organization dedicated to supporting and cultivating every aspect of Latin-American cinema and the moving image in all its forms, from its beginnings to the present. Its Latino Student Film Festival is a celebration of work from students in the Los Angeles area. The focus of the festival is on participation, allowing student filmmakers to meet and connect with their peers and screen their short films in a community environment. Films up to 5 minutes in length were presented in the categories of animation, narrative/non-narrative and documentary. During this 2–day conference, V3con highlighted and expanded multi-platform Asian and Pacific Islander American communications by gathering online journalists, creative social media communicators, seasoned bloggers, and those interested in engaging on digital platforms for interactive panels and workshops. This program explored the mutual influence and impact of Mike Kelley and the city’s artists, organizations, and spaces over his three-plus decades of working in Los Angeles. Two panel discussions offered a context for how the city received and influenced Mike Kelley during his early years in L.A. and examined how shifting local and international forces, including the art market and the academic landscape, impacted his work. The symposium featured a mix of artists, art historians, critics, and curators including George Baker, Diedrich Diederichsen, Paul McCarthy, John Miller, Jim Shaw, Joy Silverman, Howard Singerman, and Mary Clare Stevens, and was moderated by Hunter Drohojowska-Philp and MOCA Curator Bennett Simpson. 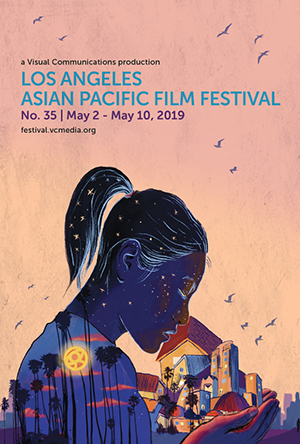 Nearly 1,500 attendees again gathered at JANM’s Tateuchi Democracy Forum to see the best and brightest at the Los Angeles Asian Pacific Film Festival’s 30th anniversary. The Festival combined special event screenings of new Asian Pacific American cinema and select encores of festival favorites. In many cases, filmmakers were on hand to participate in Q&A sessions with audiences, giving an intimate close-up peek into their minds and methods. 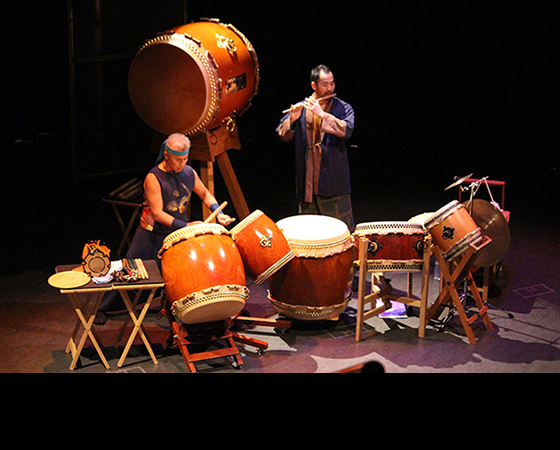 Leading taiko and flute practitioners Kenny Endo and Kaoru Watanabe combined Japanese theater, folk traditions, jazz, and other improvisational genres to wow a crowd with their fusion of the ancient and modern. A press conference and panel discussion about the history and development of Japanese cuisine and culture in America was presented by the Little Tokyo Business Association and All Japan News. Over 1,300 people attended the opening of Perseverance: Japanese Tattoo Tradition in a Modern World. The day included live tattooing demonstrations, and several of exhibition’s featured artists gave lectures on the craft and showcased several forms of traditional tattooing such as tebori. This opening day was the highest paid attendance day in the JANM’s history, including many new guests drawn by the programming and subject. This tasty presentation by a Kanbutsu Maestro—a master of preserved foods—drew 75 guests interested in learning the history and uses of dashi, a traditional Japanese cooking stock. The event also included a demonstration how to integrate dashi ingredients into everyday cooking. The 7th Annual UCLA Downtown Los Angeles Forum on transportation, land use, and the environment brought together many of today’s thought leaders on technology and the future of mobility, cities, and regions. A few topics of discussion included the latest trends in vehicle automation, what government’s role should be amidst private sector technological innovation, and what implications do new technologies, related services, and technology-enabled policies have for travel, air quality, energy conservation, and urban form. In the summer of 2013, Los Angeles-based musician and Korean adoptee DANakaDAN (Dan Matthews) was reunited with his biological family, including an identical twin brother he never knew existed, in Korea. He videotaped the journey, and in February premiered this documentary in two at-capacity screenings in the Tateuchi Democracy Forum. Over 400 people attended the screenings, Q&As, and a reception/concert featuring Crew Love, Paul Dateh, and Travis Graham. A live taping of 89.3 KPCC’s award-winning AirTalk With Larry Mantle drew 75 people for “Are Quotas Back? Anti-Asian Bias in Higher Education, Is it Real?” A panel of experts explored rumors of discriminatory quotas based on recent studies showing that, although Asian applicants to highly selective universities have higher mean SAT scores than their peers, they are rejected at a disproportionate rate. At this one-day networking event presented by the USC Spatial Sciences Institute, Geographic Information Science faculty and students discussed emerging trends in geospatial science, technology, and applications with industry leaders. Undergraduate and graduate students in GIS and related geospatial disciplines were able to present papers, learn from industry speakers, and network throughout the summit. Industry professionals shared insights about emerging geospatial trends, creating greater awareness of their work, and connecting with other geospatial professionals in the region. More than 200 attendees had the opportunity to meet the Heart Mountain Wyoming Foundation leadership and ask questions during a town hall meeting, featuring remarks by Congresswoman Judy Chu. A premiere screening of an extended version of Witness: The Legacy of Heart Mountain, produced by ABC7 reporter David Ono and Jeff MacIntyre, followed the meeting. A new chapter in the documentary is about the childhood friendship between Norman Mineta and Alan Simpson, both Boy Scouts. Mineta was interned at Heart Mountain and Simpson lived in a nearby town. Their bond proved important to the redress movement, when Mineta was a Democratic member of the House and Simpson was a Republican member of the Senate. Since 1989, the Los Angeles County Metropolitan Transportation Authority—Metro—has commissioned artists to incorporate artworks into a wide array of transportation projects throughout Los Angeles County. The agency has received numerous design and artistic excellence awards, and is renowned for its approaches to integrating art into the transit experience and for engaging artists at all levels of their careers. At this workshop, artists were able to learn about upcoming opportunities and how to apply for them. Early in 2013, Los Angeles City Council President Herb Wesson asked former U.S. Commerce Secretary Mickey Kantor to establish an independent, private commission to study and report on fiscal stability and job growth in Los Angeles. 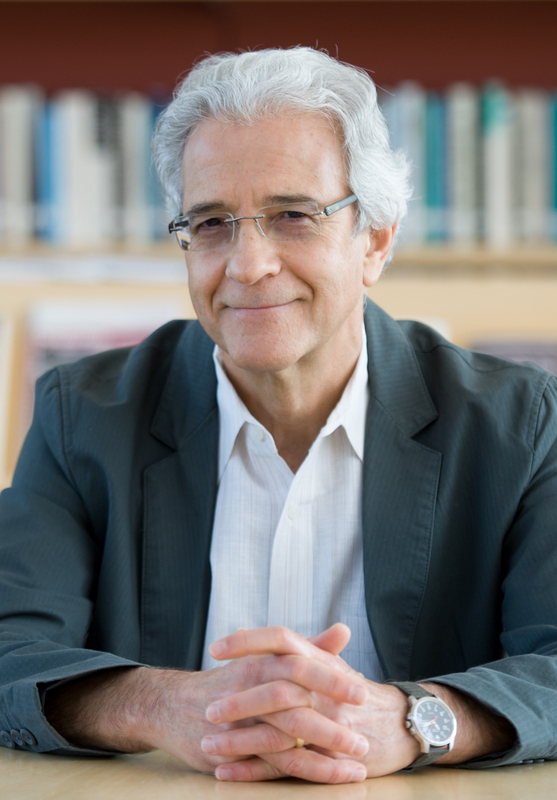 Kantor invited leaders in the Los Angeles community to serve on the Commission as volunteers, and the Commission published its first report, A Time for Truth, in January 2014. A candid assessment of the challenges and opportunities Los Angeles faces, A Time for Truth was presented at a press conference in the Tateuchi Democracy Forum. Presented by Printed Matter, the 2nd Annual LA Art Book Fair took place at the JANM-adjacent Geffen Contemporary at MOCA. Free and open to the public, the LA Art Book Fair is a unique event for artists’ books, art catalogs, monographs, periodicals, and zines presented by over 250 international presses, booksellers, antiquarians, artists, and independent publishers. The Tateuchi Democracy Forum served as the venue for screenings, panels, and performances. 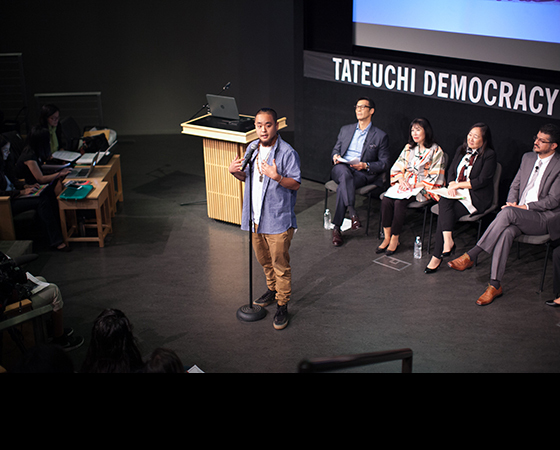 The Tateuchi Democracy Forum was filled to capacity for Issei: The First Generation, a documentary chronicling the lives of the first wave of Japanese immigrants who started new lives on the West Coast at the turn of the century. A Q&A session with Director Toshi Washizu and UCLA Professor Dr. Lane Hirabayashi followed the screening.